We're still not picking sides in the great war of "Who Will Chelsea Wear To Her Wedding?" 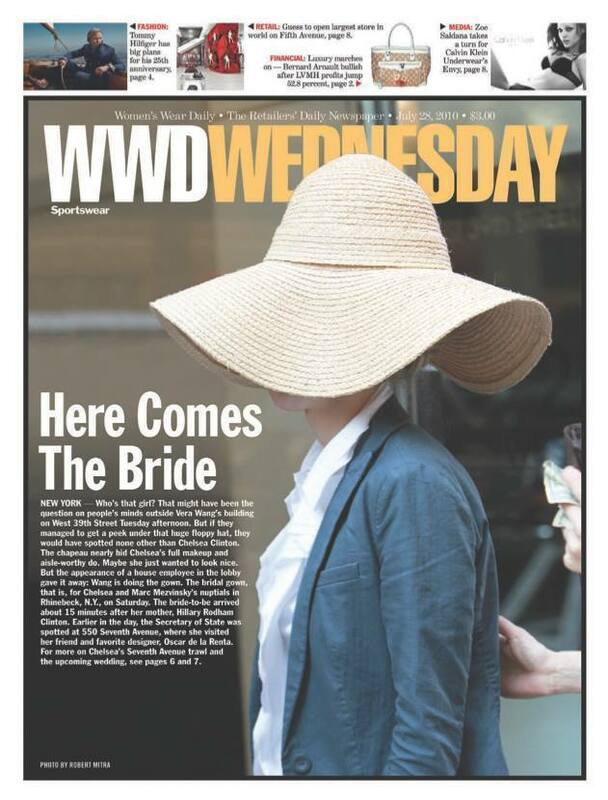 but WWD caught the bride-to-be visiting Vera Wang on Tuesday afternoon. Chelsea arrived 15 minutes after her mother got there for the 4 p.m. appointment, and she donned a floppy hat to cover her what we're assuming is her wedding hairdo. Earlier that day, Hillary was spotted at Oscar de la Renta's Seventh Avenue showroom. There are varying reports on whether Chelsea was present at that meeting. The Clintons, Vera Wang and Oscar de la Renta all declined to talk to WWD.